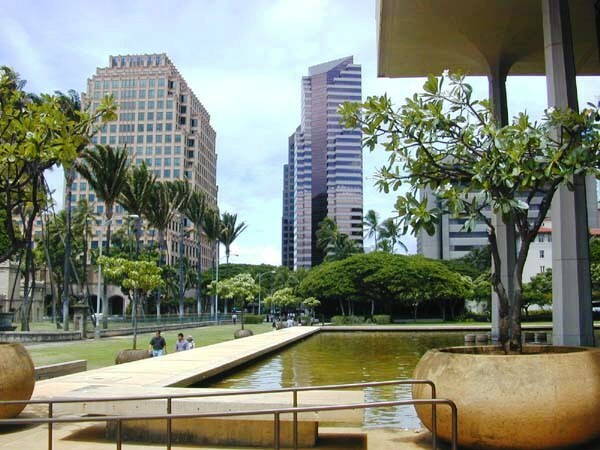 Dead fish are floating in two reflecting pools at the Hawaii State Capitol that are supposed to symbolize the ocean waters surrounding the islands. It’s the latest in a series of maintenance issues that have arisen since the Capitol was completed in 1969. Civil Beat. The ‘Brutal Reality’ Of Owning A Condo In Hawaii. They’re often the only homes people can afford, but maintenance fees can suddenly explode. Should the state do more for owners? Civil Beat. The state’s decision to privatize three neighbor island hospitals is having some unexpected fiscal fallout, with experts in the public-employee pension system estimating that privatizing Maui Memorial Medical Center and two other facilities will add $213 million to the unfunded liability of the public-employees pension fund. Star-Advertiser. Hawaii became the first state Friday to sue Takata, the Japanese auto parts maker ordered to recall millions of its airbags because of a deadly defect. Honda Motor, the automaker most affected by the recalls, is also named as a defendant. Pacific Business News. When major earthquakes happen in the Pacific "Ring of Fire," Hawai'i is always on alert for potential tsunami threats, but researchers say we may have been underestimating the chance of a mega-tsunami affecting Hawai'i. KITV4. Honolulu rail’s federal partners believe it will cost $700 million to $1.2 billion more than local rail officials’ most recent estimates to complete Oahu’s elevated transit system — a revelation that throws the future scope and design of the largest public works project in state history into question. Star-Advertiser. Honolulu’s rail project is now expected to cost taxpayers $6.9 billion, about $1.6 billion more than the original price tag for the 20-mile rail line. Civil Beat. Peter Carlisle is running for mayor of Honolulu, seeking to take back the office he lost to Kirk Caldwell four years ago. At a press conference Friday morning held downtown at the law offices of O’Connor Playdon & Guben, where Carlisle is an attorney, the former mayor said rail is his top priority. Civil Beat. A Hawaii Supreme Court decision is forcing the city to continue trash collection for scores of apartments, condominiums and nonprofit buildings, a service city officials have been trying to put the brakes on for more than a year. Star-Advertiser. A U.S. district judge has dismissed a former Ansaldo safety manager’s whistleblower suit, ruling that he did not show sufficient evidence that the local rail operator forced him to leave his job. Star-Advertiser. The City Council Budget Committee, making its last pass on 2017 budget bills, restored about $4 million aimed at programs to help the homeless but again refused funding for a new housing office requested by Mayor Kirk Caldwell. Star-Advertiser. Shoulders slumped and faces fell as 10 formerly homeless people with HIV and AIDS were told that the federal government will no longer pay for their housing after Aug. 31. Star-Advertiser. Just 100 feet from the ocean, a two-bedroom home in Kekaha is supposed to serve as the IBEW's Local 1260's Kauai office. But it also serves as a retreat for union members. At a time when the local was raising dues for hundreds, it paid more than $680,000 for the beachfront home on the Garden Isle. Critics say it's just another example of lavish spending by the IBEW's embattled business manager Brian Ahakuelo. Hawaii News Now. Former leader of contractors association sentenced to 42 months in prison. Pacific Business News. This corpse flower is no shrinking violet. And anyone who caught a whiff of it in bloom this week at Foster Botanical Garden certainly knows the pungent blossom lives up to its name. Hawaii Public Radio. Five Native Hawaiians are asking to participate in a hearing for the construction permit of the Thirty Meter Telescope on Mauna Kea. Their requests, submitted this week to the state Land Board, say they have cultural and traditional rights to Mauna Kea and that their participation will help the board make a decision. Associated Press. The Thirty Meter Telescope’s land use permit isn’t the only thing the state Land Board is being asked to reconsider for the $1.4 billion project. In April, 3rd Circuit Court Judge Greg Nakamura officially remanded the project’s Mauna Kea sublease to the panel for additional review.Tribune-Herald. Gov. David Ige last week signed into law a measure that requires certain contested case hearings, including the one about to get underway for the TMT, to be appealed directly to the Hawaii Supreme Court. Star-Advertiser. Coping with Cohabitation: Micro housing project pushes homeless, business to coexist. West Hawaii Today. Homeless ranks swell, frustrate business sector in Kona Old Industrial Area. West Hawaii Today. From the beginning of 2014 until mid-April this year, the Hawaii Police Department issued a total of 5,904 citations for the use of a mobile electronic device while driving. Tribune-Herald. Na Wai Ola, a Puna-based public charter school, needs to make some big decisions — and soon — in order to keep its charter and ultimately stay open. Tribune-Herald. A Kailua-Kona couple’s plans to replace a 50-year-old wall fronting their Alii Drive property has run afoul of county permitting laws. West Hawaii Today. Most property tax rates will be dropping next fiscal year with others remaining flat after Maui County Council members passed a resolution Friday to set the tax rates that will take effect July 1. Maui News. With more than three weeks to go before a deadline for candidates to file their nomination papers, it's becoming increasing clear some incumbents will face tough challenges while others may win re-election simply because they're unopposed. Maui News. Maui researchers at the Pacific Disaster Center have tracked many of the major disasters that have hit the world over the past decade from Hurricane Katrina to super typhoons in the Philippines. Maui News. Maui County Corporation Counsel Patrick Wong has again reported gambling winnings in his required financial disclosure statement to the Maui County Board of Ethics. Maui News. Bills relating to the General Excise Tax and homestays are scheduled for a second reading during the Kauai County Council meeting Wednesday. Bill No. 261o proposes raising the GET a quarter of a percent, as a way to raise funds for tackling just over $100 million worth of backlogged road repairs. Garden Island. Nawiliwili Harbor and the Port Allen Harbor are included in The Energy and Water Appropriations Act of more than $3 million which was supported by Sen. Mazie K. Hirono. Garden Island. A $70,000 project aimed at improving pedestrian safety on Waikomo Road was deferred in committee by the Kauai Council Wednesday. Garden Island.